2x4 / 4x4, elektrooniliselt lülitatavad, ees ja taga eraldi diferentsiaalilukusti, Kardaanülekandega. The best and most powerful of all time Blade combines cutting-edge technology and years of experience in brand TGB. The most crucial competitive advantage of this new generation model Blade is in addition to the largest and strongest engine TGB especially unique 4x4 system with front and rear locking differentials. 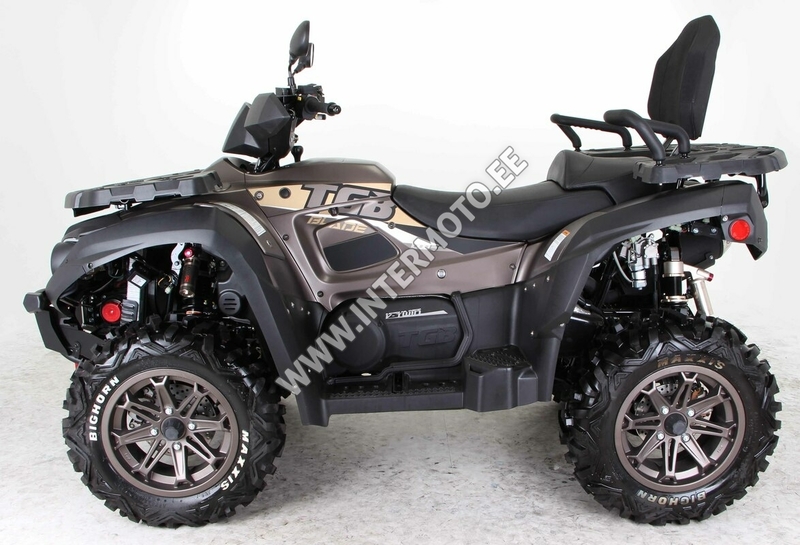 With this system, you will manage the new blade as easily as any other four-wheeler, and together with independent suspension all wheels will surprise you with an extremely easy to control, quiet ride on soft and hard surfaces and high throughput even in the most difficult terrain. 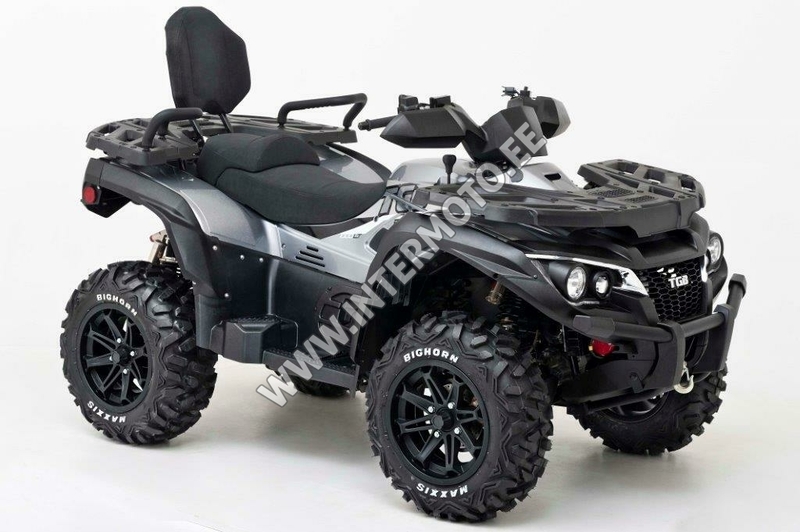 Extended chassis allows for a great climb and excellent stability at high speed while maintaining the renowned dexterity and good controllability of short models. The newly developed four-stroke twin cylinder OHC 1000 delivers a superior dynamism and tremendous pulling power. 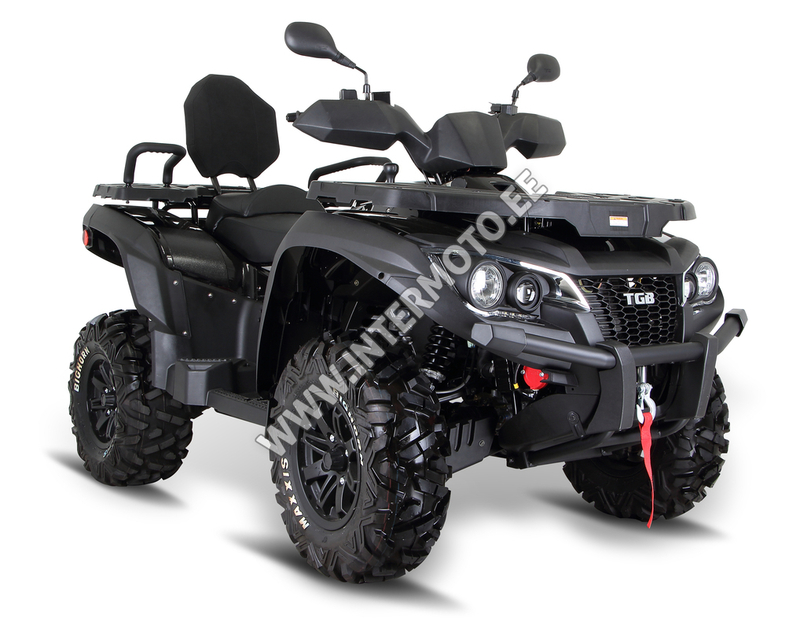 The latest generation of the popular a utility and recreational ATV is already in the base version equipped as standard with high-quality electric winch 3000 lbs, attractive aluminum wheels, towing equipment, hi-tech and high-quality LED lighting with new shock absorbers EVO with progressively coiled springs. Big powerful twin cylinder OHC In 1000 huge power is completely newly developed. 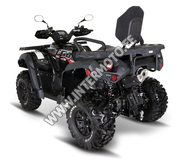 Pure Performance provides quad dominant dynamics, high torque gives it superior pulling power. Electronic fuel injection independent of altitude ensures reliable starting, clean combustion and low fuel consumption. Reliable robust automatic transmission'heavy-duty' positions with L / H / N / R (off-reduction / speed forward / neutral / reverse) with a minimum of maintenance is also fitted with an effective engine brake. The biggest advantage of the model Blade 1000 is its unique drive system with differential on front and rear axle and two electric locks. 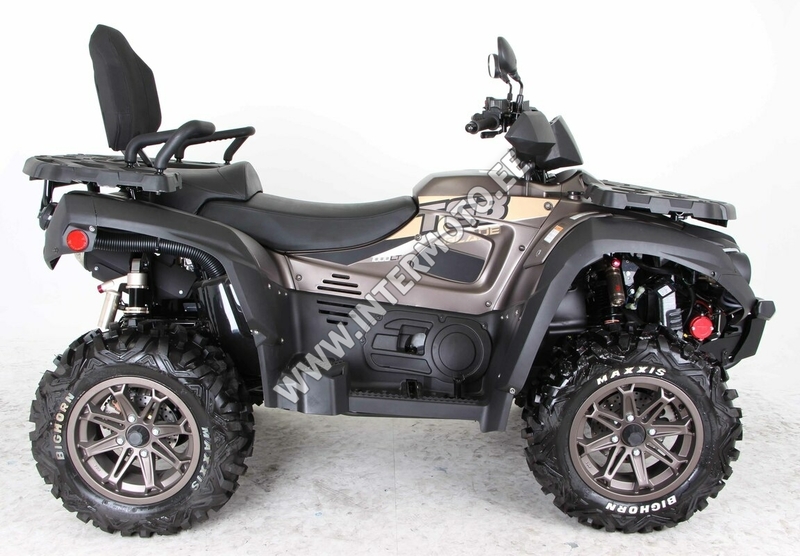 This makes the new Blade one of the very nicest ATVs to control and allows ideally configured drive and traction for every terrain and every situation - on the one hand ensuring a perfect grip on all wheels and high-throughput quad in difficult terrain, but also provides an extremely refined and quiet ride and perfectly pleasant driving. 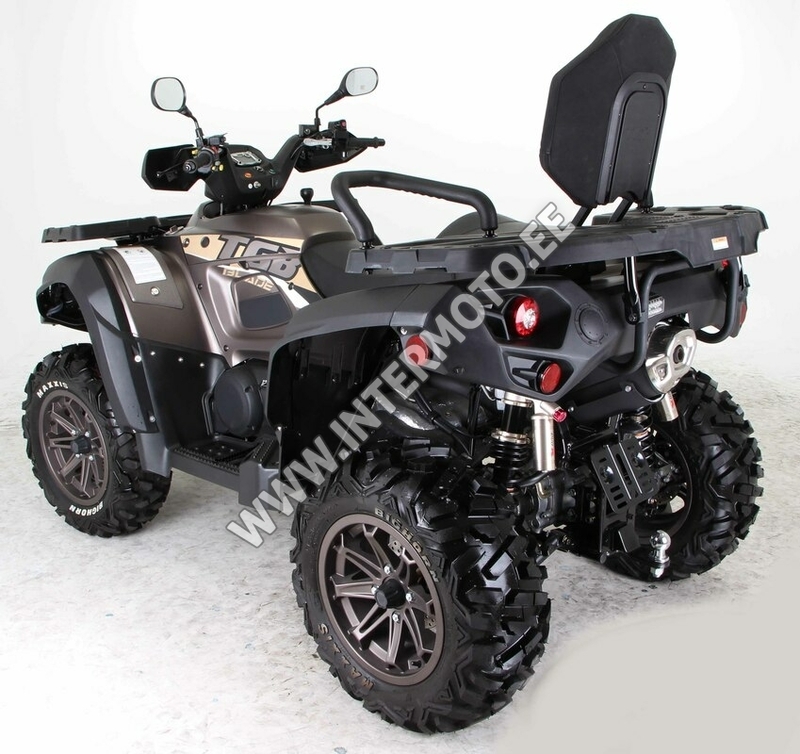 Naturally, there is a modern wheel independent suspension IRS wide track and high ground clearance, long wheelbase and electrically connectable front-wheel drive 2x4 / 4x4 simply by pressing a button on the handlebars. In addition, most difficult terrain quickly appreciate working electric locking front and rear differentials. Brakes are as important as engine performance. Čtyřkotoučový powerful hydraulic brake system with drilled discs of large diameter tubes and armored brake gives you a feeling of confidence while pushing your riding skills. Foot brake service brakes all wheels simultaneously 60/40, the right stick, you can also control the front brake, the left rear brake lever. The parking brake is activated by a single lever on the handlebars. Attractive modern LED daytime running lights, coupled with integrated front blinker interesting at first glance. 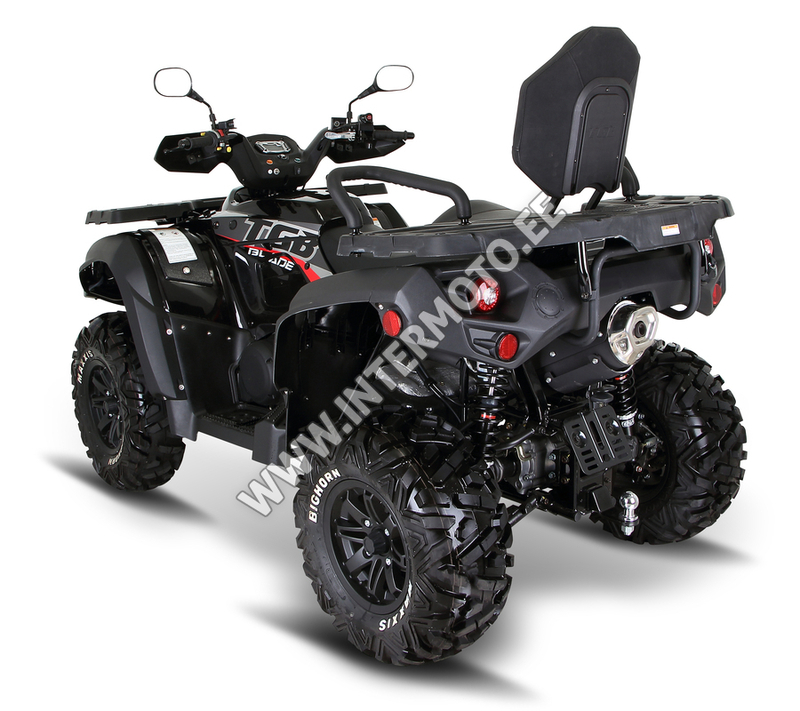 Along with dual LED rear lights and a flashing LED rear and a model Blade 1000 adult and attractive appearance. And when the sun goes down, a powerful dual projector headlamps are always reliably help you find your way home. Accurate information whenever needed. Multifunction LCD display is not only readable but also beautiful and offers many practical features such as a digital tachometer, digital speedometer, maximum achieved engine speed, maximum speed achieved, average speed, 2 counters daily mileage, total mileage, daily counter, mileage reading, total mileage counter, hour meter, fuel gauge, clock board, imaging diagnostic trouble codes and all necessary lights. 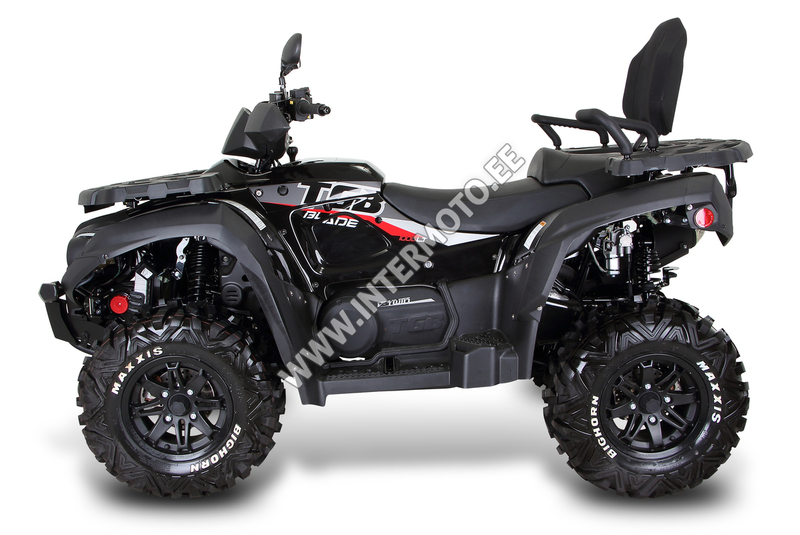 On the market there are not many ATVs that already so attractive base price yet to offer such a rich standard equipment, such as Blade 1000 LT. Blade 1000 LT is a standard fully equipped with the latest technology as two differentials (front and rear) with electric locks, electrically switchable drive 2x4 / 4x4, čtyřkotoučový braking system, armored brake lines, attractive 8paprskové aluminum wheels with sharply pointed rays, brand name tires Maxxis Bighorn themselves and hand levers, robust front protective frame, front and rear luggage rack, separate elevated passenger seat with a comfortable backrest, footrest removable passenger, hi-tech LED lighting, towing and quality reel with high tractive force of 3000 lbs.